Algorithmic Trading or High Frequency Trading or Black Box Trading according to a new report by the British Government’s Office for Science, Foresight, is set to replace Human Trading in the global stock markets. 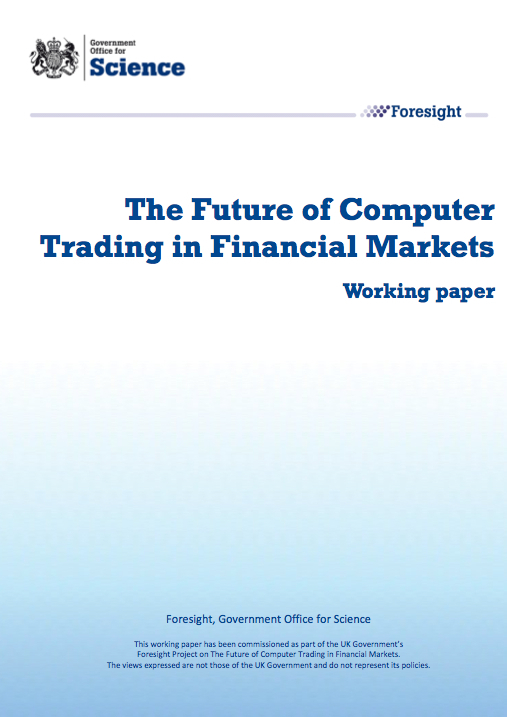 This form of trading is undertaken through decisions made by computers, primarily based upon large volumes of information/data related to previous market behaviour. In 2007, 50% of all equity trading in the United States was undertaken via algorithms and at present, this is 75%. In Europe, it is presently 40%. We’re running through the United States with dynamite and rock saws so that an algorithm can close the deal three microseconds faster, all for a communications framework that no human will ever know; that’s a kind of manifest destiny. The above words by Kevin Slavin were made in relation to the present construction of a high-speed fibre-optic cable between Chicago and New York to facilitate black box trading and comes from his TED talk titled, How Algorithms Shape Our World. Addressing some of the thematics outlined in the Foresight working paper. Slavin, a designer and consultant in the field of technology, argues, ‘that we’re living in a world designed for, and increasingly controlled by, algorithms’, and through the course of his presentation shows ‘how these complex computer programs determine espionage tactics, stock prices, movie scripts, and architecture’. Critically, Slavin warns how ‘we are writing code we can’t understand, with implications we can’t control’. You are currently reading Normalisation of Deviance at THEMARKET.